Finding a roofing material that can stand up to extremes of wind, heat, humidity and precipitation can be a challenge. The solution is metal roofing from Southeastern Metals™. 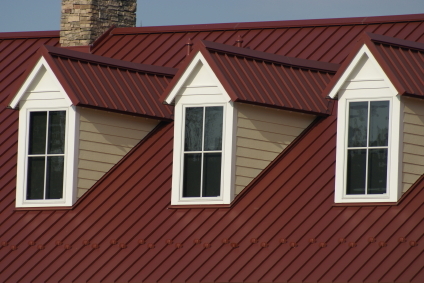 Here’s a closer look at the unique benefits of advanced metal roofing products. Strong. In heavy winds, shingles can be ripped right off your home. A metal roof can withstand high winds of 110-150 mph with no negative effects. The same holds true for hail. Where other roofing materials will be ruined by a heavy hailstorm, you won’t even be able to tell that hail hit a metal roof. Lightweight. A metal roof averages only one pound of weight per square foot. By contrast, asphalt shingles weigh two to five pounds, depending on style, and concrete tile can weigh more than 10 pounds per square foot! Metal roofing takes a tremendous amount of load off your home’s structure, which can eliminate the need for additional structural support. Reflective. When treated with a specialized coating that reflects solar energy, the Cool Metal Roofing Coalition estimates that reflective metal roofing can save your home up to 40% in summer cooling costs, depending on your location. Long-lasting. While a metal roof can cost more initially, the payoff comes in the form of longevity. At 50 years or more, a metal roof will outlast its asphalt shingle counterparts by two or three times. Chances are, a metal roof will be the last roof you ever install on your home. Attractive. Metal roofing is beautiful and comes in a wide range of colors and configurations to fit your architectural requirements and tastes. See the many panel profiles produced by Southeastern Metals. Gentle on the environment. Metal roofing is 100% recyclable, which eliminates the growing problem of disposal. In most cases it can be installed over your existing roof, further resolving the shingle disposal dilemma. Enjoy all these benefits and more with state-of-the-art metal roofing products from Southeastern Metals. Our panels are Miami Dade County, Florida Building Code & Texas Department of Insurance Compliant, and designed to complement any residential or commercial project. We also offer free take-off and estimating services for your convenience. For more information, call us today at (800) 874-0335 or submit a contact request. SEMCO’s distribution area includes Florida, Alabama, Mississippi, Georgia, North Carolina, South Carolina and Tennessee.